If there are two things Microgaming is renowned for, it’s a knack for offering slots with unusual settings and compelling, innovative gameplay. But even still, the studio has truly pushed the boat out with its latest 243-ways offering, Untamed Giant Panda. Untamed Giant Panda transports gamblers into the bamboo-laden forests of the Chinese wilderness, where these mysterious, beautiful – but endangered – animals live. From dramatic mountain vistas to the endearing images of baby pandas, the fully animated tiles certainly catch the eye. 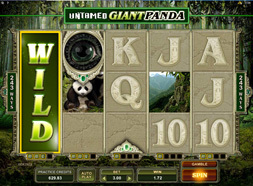 And with a soundtrack and background image that’s right in keeping with the sweaty bamboo forest theme, it’s clear that Microgaming has worked its atmospheric magic once again with Untamed Giant Panda. But there’s no shortage of substance beneath that lush, green styling. And certainly, compared to other major slots, it’s clear that Untamed Giant Panda is one of the most innovative titles going. At its heart lies a standard 243-way slot game, but it’s the peripheral features that really stand out. The first of these is the collect-a-wild feature. Each of the five reels has four wild slots, which are filled up whenever a wild lands on that reel. Once all four slots have been filled, the whole reel becomes one giant wild symbol, offering big wins. It’s also features Lucky Nudge, where wild symbols which are just out of view above or below a reel can roll down to give you the symbols needed to enter the free spin bonus mode. The final signature feature is the gamble button. Whenever you win something – be it a small prize, or a massive one – you can go into the bonus Gamble mode at the click of a button. Here you’ll find a wheel with two areas – win or lose – and a spinner. Spin the spinner, and see which area it lands in. If it lands in the win area, your winnings increase. You can adjust the size of these two areas, which in turn alters the risk/reward dynamic. Increasing the size of the lose area will increase the risk of losing, but also the amount you stand to win. Play Untamed Giant Panda today! Microgaming’s Untamed series is one of the most innovative new slots series around. And with up to 5000 coins up for grabs Giant Panda is well worth a look - especially if you enjoyed the likes of Immortal Romance and Gold Factory. Check out the game at All-Slots Casino today!